As we age, the skins natural shedding process slows down. As a result, excess skin cells accumulate in the epidermal layer of the skin, causing ones complexion to appear dull and rugged. Just below the surface are younger, more radiant skin cell just waiting to be seen. 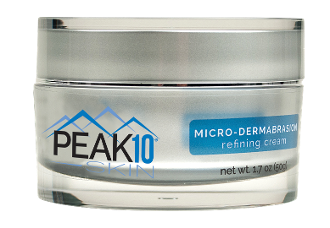 Let your beautiful fresh skin be seen with PEAK 10 SKIN’s Micro-Dermabrasion refining cream. This exfoliating hero uses medial grade aluminum oxide crystals to rinse away dirt and dead cell build up on your face. The skin sloughing and dirt attracting crystals are combined with powerful anti-oxidant ingredients, to ensure the cleanest of scrubs and provide the newly exposed cells with skin nourishing nutrients, essential oils and hydration. Apply micro-dermabrasion cream on moist skin using gentle circular motion with your fingertips. Rinse with cool water. Discontinue use if redness or irritation occurs. Alumina (Aluminum Oxide Crystals), Purified Water (Aqua), Simmondsia Chinensis (Jojoba) Seed Oil, Aspalatus Linearis (Red Tea) Extract, Prunus Armeniaca (Apricot) Kernel Oil, Squalane, Hyaluronic Acid, Laureth-7, C13-14 Isoparaffin, Polyacrylamide, Eriobotrya, Japonica Extract, Phenoxyethanol, Ethylhexylglycerin.